health care culture has changed for the better. The 9th Annual NPSF Lucian Leape Institute Forum & Keynote Dinner focused on safety culture, leadership, and strategies for the real world. Imagine it is 2046. What changes will have taken place to improve the safety of patients and the health care workforce? What would you like to see happen over the next 30 years—and what are you willing to do to make it a reality? Those were among the questions posed to attendees of the 9th annual NPSF Lucian Leape Institute Forum & Keynote Dinner held in Boston on September 15. Dana Siegal, RN, CPHRM, CPPS, director of patient safety services, CRICO Strategies, led an afternoon session punctuated by skits illustrating one dramatic change in health care culture over the years: the move to tobacco-free health care organizations. Ms. Siegal recounted how, 30 years ago when she was a new nurse, smoking in hospitals was not uncommon among doctors, nurses, and even patients (unless on oxygen, of course!). Slowly, things began to change; smoking was confined to the “back room,” then to the outdoors. And finally, not all that long ago, tobacco was largely banned from the grounds of most hospitals, including parking lots. What does smoking have to do with patient safety? The point Ms. Siegal hit upon is that culture change does not happen overnight. It takes time, sometimes a very long time, for norms and attitudes to spread throughout an organization, a community, a region, an industry, and in this case, across the country. She invited attendees to share their wishes for what health care and patient safety would look like in 30 years. What would you want to see happen over the next 30 years? The afternoon keynote speaker, renowned patient safety researcher Charles Vincent, PhD, MPhil, gave attendees a glimpse of what the future might look like. of assessing risk and promoting safety in health care. Currently Emeritus Professor, Clinical Safety Research, at Imperial College, London, Prof. Vincent has an extensive background in research on the causes of harm to patients, consequences for patients and staff, and methods of improving the safety of health care. His most recent book, Safer Healthcare: Strategies for the Real World (co-authored with René Amalberti) is available at no charge as an e-book (download at http://www.springer.com/it/book/9783319255576). Prof. Vincent’s talk centered on the question of whether it is possible to develop a framework or menu of interventions around patient safety, rather than addressing issues by project or outcome. He noted the correlation to a recent NPSF report calling for an overarching shift from piecemeal approaches to total systems safety. Avoiding risk (ultra-safe): Examples from outside of health care include the airline industry. This model is characterized by a tough regulatory system and the need to avoid risk as much as possible. Managing risk (high reliability): Risk is not sought out, but is inherent in the work, for example, firefighting. This model is marked by group intelligence and adaptation, with training and safety focused on flexibility and personal resilience being a key component. Embracing risk (ultra-adaptive): An apt example here is deep-sea fishing, where risk is the essence of the profession. Working conditions are unstable and unpredictable. While some areas of health care may fall into the ultra-safe category, where the goal is to avoid risk altogether, other areas may be categorized by the need to manage or mitigate risk. Another example Prof. Vincent offered to illustrate the point is home dialysis. Patients and families performing dialysis in the home are trained in how to do it and in safety practices. But they are also schooled in what to do if something goes wrong, which Prof. Vincent said works better than drilling in to people that they have to do things perfectly every time. success of patient safety initiatives. Quoting Max DePree, Dr. Cipriano noted that, “When we talk about patient safety, the leader is the servant.” Leaders of health care organizations are the key to setting the bar for safety in their organizations, but not all health care leaders are aligned with the principles that are so important to patient safety. Dr. Cipriano also cautioned that unintended consequences can result from aggressive agendas. “We don’t always go back and look at the impact” of initiatives, she said. She offered the example of the practice of isolating patients with Methicillin-resistant Staphylococcus aureus (MRSA) and using contact precautions (gloves and gowns). For years, clinicians and regulators supported the practice of implementing contact precautions of patients found to have MRSA. This process was mandated in a number of states. In 2015, a study argued that the benefits of contact precautions had not been proven, no study had directly compared the effectiveness of contact precautions to standard precautions, even as we know that the use of contact precautions has deleterious effects (psychological and otherwise) on patients. As a result, some hospitals are now moving away from the use of contact precautions and isolation for patients with MRSA. Excelling in patient safety requires that practices, protocols, and initiatives get reviewed and, if necessary, revised over time. Or, as Prof. Vincent notes in his book, patient safety is "a moving target." “In a very real sense innovation and improving standards create new forms of harm in that there are new ways the healthcare system can fail patients,” he writes. So, we zealots have work to do. What would you like to see change about safety culture in health care? Comment on this post below. Note: to post a comment you must be logged in. Register or log in. Patricia McTiernan, MS is assistant vice president for communications at the National Patient Safety Foundation and editor of the P.S. Blog. Contact her at pmctiernan@npsf.org. kicked off the evening program. The 8th Annual NPSF Lucian Leape Institute Forum & Keynote Dinner touched upon issues that are the keys to moving the patient safety agenda forward. Would your hospital allow a news reporter to follow along as the leadership team conducted WalkRounds? What does your hospital do to provide support to clinicians involved in medical errors? Would you ever hesitate to recommend your physician or hospital to a friend or loved one? These questions may not come up in day-to-day patient safety work, with its focus on numbers, data, protocols, and checklists. But they are among the thoughts provoked by the presentations at this year’s NPSF Lucian Leape Institute Forum & Keynote Dinner, held in Boston last week. 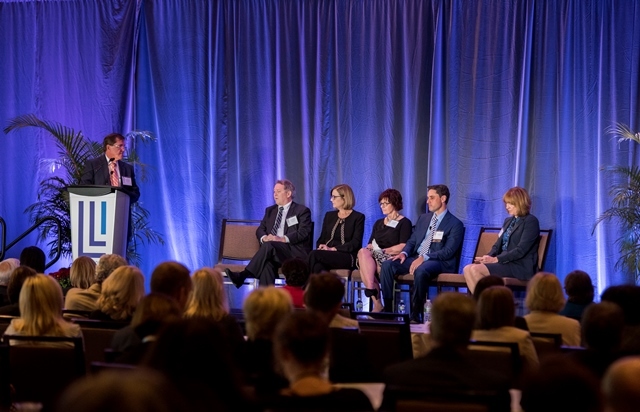 Leadership, culture, patient experience, and workforce safety took center stage as the event’s presentations demonstrated the value of transparency in health care and the importance of leaders in influencing behavior within our health care organizations. The Institute’s most recent report argues that greater transparency in health care – at all levels – can fuel better, safer care. With that report as the backdrop, Dr. Darrell “Skip” Campbell shared experiences from his work as a surgeon, researcher, and chief medical officer as well as from his current role as director of the Michigan Surgical Quality Collaborative. Dr. Campbell pointed to research that showed that staff who had participated in Leadership WalkRounds were more likely than those who had never participated to say they would speak up when faced with a potential or actual medical error. During his time at University of Michigan Health System, Dr. Campbell was so confident in the promise of WalkRounds to drive improvement, he invited a news reporter to observe the ritual. In his role as director of MSQC, Dr. Campbell works on a different level of transparency—between providers. MSQC is certified by the Agency for Healthcare Research and Quality as a patient safety organization and is made up of 73 member organizations across the state that agree to share data on surgical outcomes and not compete on safety. MSQC works to identify top performers through the analysis of data; visits them, talk to them, and figures out what it is that they are doing to achieve the good results; and then distributes that information to the other members. One of their early successes has been a state-wide decrease in surgical site infections after colectomy. Dr. Gary Kaplan, chairman and CEO of Virginia Mason Health System and chair of the NPSF Lucian Leape Institute noted in his opening remarks that there are challenges and opportunities around the issue of transparency, as well as significant barriers. The Institute’s current focus is on translating its recommendations into action. The single biggest area of concern is leadership’s role and the widespread failure to set expectations to create and support a safety culture. Education is valuable, but it needs to be done correctly and embedded in the organization’s behavior. Transparency can be powerful tool, but it needs to be used responsibly, with data that make sense and are delivered in useful ways. There is a lack of appreciation for engagement by boards of directors in the issue of patient safety; board education on the issue is needed. Provider-to-provider sharing of data and information is difficult to achieve, but is essential for progress. Everyone in the organization needs to support the core mission of patient and workforce centricity – whether they are a housekeeper or a lawyer. Information without action is not productive. It is the responsibility of the person reporting substandard care to be accurate, fair, and thorough, and the responsibility of the receiver to listen and understand the problem with the goal of fixing it if possible. Where Does Apology Come In? The afternoon concluded with an overview of the Massachusetts Alliance for Communication and Resolution following Medical Injury (MACRMI) and a panel discussion featuring staff of Beth Israel Deaconess Hospital in Boston, an organization that helped pioneer the MACRMI roadmap to respond to adverse events and suspected medical errors. Dr. Alan Woodward was instrumental in starting MACRMI in 2005, when he was president of the Massachusetts Medical Society. “We were beating our heads against the wall with tort reform,” he said. “But we wanted to do something about patient safety.” He met with Rick Boothman at the University of Michigan, and eventually formed an alliance of hospitals in Massachusetts. Dr. Kenneth Sands, chief quality officer of Beth Israel Deaconess, served as principal investigator of MACRMI’s study, funded by the Agency for Healthcare Research and Quality, to identify the major impediments to apology and disclosure and strategies to overcome them. This work led to the MACRMI roadmap, known as CARe—communication, apology, and resolution following medical injury. Dr. Sands facilitated a panel discussion of a case that was handled through the CARe process. In the case presented, a communication breakdown led to a delayed cancer diagnosis. Speaking via a video, the patient explained that she found out she had cancer only after persisting in telling her doctor that something wasn’t right after her gallbladder surgery. “Patients shouldn’t have to figure this out for themselves,” she said. In an important part of the process, the patient met with the vice chair of the department of surgery, who explained what happened and how, and what the organization was doing to prevent it from happening again. Dr. Jonathan Perlin, the evening keynote speaker, began his talk, "To Care Is Human," by asking the question, “Would you ever hesitate to recommend your physician or hospital to a friend or loved one?” A former, long-time member of the NPSF Board of Directors, current chair of the American Hospital Association, and chief medical officer of Hospital Corporation of America, Dr. Perlin argued that patient safety and patient experience go hand-in-hand. He told four patient stories, each through the lens of the HCAHPS survey (Hospital Consumer Assessment of Healthcare Provider and Systems). hospital to a friend or loved one? A noted expert in health information technology, Dr. Perlin suggested that better use of data could also help providers improve care and safety. “If each of us read two articles per night, we’d only be behind by 10,000 articles,” he said. “Care informs care.” More effective use of the digital records we are creating can be part of a learning health system. Have you done work to improve the culture or the patient experience in your organization? Comment on this post below. Note: to post a comment you must be logged in. Register or log in. About the Author: Patricia McTiernan, MS is assistant vice president for communications at the National Patient Safety Foundation and editor of the P.S. Blog. Contact her at pmctiernan@npsf.org.